Email marketing is a powerful way to strengthen relationships with existing customers and acquire new ones. Using cinemagraphs in your email campaigns will create a more memorable and unique experience for the recipient. Read more about how “living photos” can help you reach your marketing objectives. Email marketing is an easy and measurable way to engage your current and potential customers. Because of the low costs involved, this form of marketing is suitable for businesses of all sizes. While the quality and the relevance of the written content are undoubtedly of great importance, they become irrelevant if you’re not able to hold your recipient’s attention. 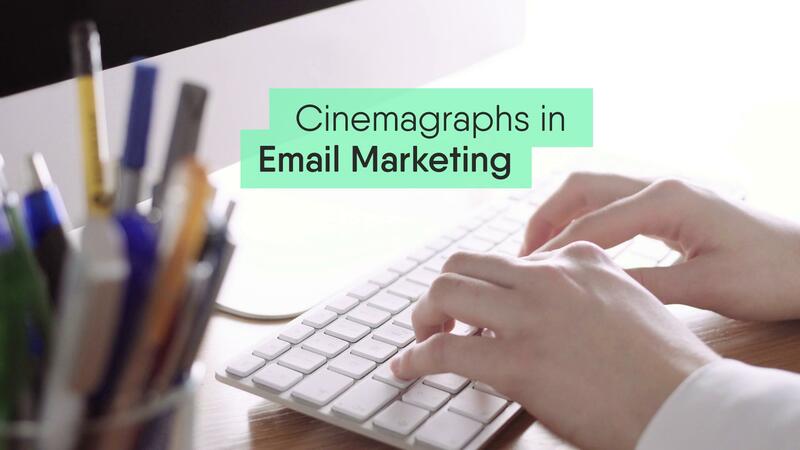 One way to capture and maintain your client’s interest is to include cinemagraphs in your e-mail marketing strategy. Using “living photos” can provide an exclusive experience and help your email stand out. Not only are cinemagraphs easy to insert into emails as GIF files, they can also help you reach a variety of sales goals. Here are 3 ways to make them work for your business. 1. Newsletters: Make Yourself Memorable! Publishing a newsletter can help you stay at the forefront of your customers’ minds. Including cinemagraphs in monthly updates provides your clients with an unusual and memorable experience – a change from the still images they typically see in newsletters. Compared to static photos, cinemagraphs create more curiosity and engagement, often reflected by high response rates. While other companies are using still images in their newsletters, why not give your customers something extraordinary to talk about during their coffee breaks? 2. Sales Emails: Give Yourself an Unfair Advantage! Sales emails can be a great way to reach out to prospects and acquire new customers. Since most marketing managers receive up to 50 emails per day from service providers, you need something special to stand out from the masses. Including a relevant cinemagraph at the top of your message or in your signature can give your sales email that much-needed visibility and pique your lead’s interest. Why use still images, when cinemagraphs can be your secret weapon and fire up your sales drive? Give yourself that unfair advantage over your competitors. 3. eCards: Extend Your Reach! Sending your customers eCards or – better yet – offering them a tool to send their own personalised eCards to friends and family can be a great way to extend your reach and grow brand awareness. Combine such an eCard tool with cinemagraphs and you have a winning formula: “living photos” will give your eCards a novelty factor and increase their virality. We here at gallereplay launched our own cinemagraph eCard tool this past Christmas. Via gallereplay.com/ecard, users could send customised greetings containing cinemagraphs to their loved ones for free. As the eCards spread and began to gain traction, there was a significant spike in traffic: during the week leading up to Christmas we saw an 80% increase in the number of sessions per day on our website (see graphic below). Of that traffic, a staggering 81,35% were new visitors, coming into contact with gallereplay for the first time. In short, cinemagraph eCards helped us boost traffic to our site and reach a new audience. Screenshot from Google Analytics showing the peak in traffic thanks to our eCard tool. Offering consumers a creative and fun tool completely free of charge, meant they were willing to send out emails promoting a branded tool to their friends and family. Not only is it possible to make an audience aware of your brand in this way, if your tool functions well, their first association with your brand will be a positive one. In conclusion, cinemagraphs can help you reach your marketing and sales goals in a number of ways. They create a unique and unforgettable experience for your newsletter subscribers. They’re a great way to give your sales email more visibility. And finally, making branded cinemagraph eCards available to consumers will help you extend your reach, leading to a higher brand value. Interested in offering your clients an eCard tool like gallereplay’s? Write us an email at hello@gallereplay.com to find out more. In need of cinemagraphs for your next newsletter? Browse our stock collection.